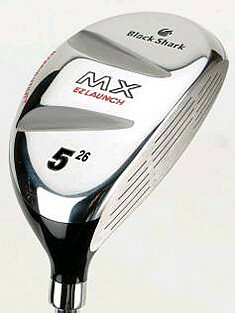 -Like the Callaway Big Bertha Heaven Wood Hybrids! INCREASED PERFORMANCE FOR BETTER SHOT MAKING TO REPLACE YOUR 2, 3, 4, AND 5 IRONS! For FAQ's about Club Fitting and 'How To Order', Click Here! CaddyBytes Black Shark MX EZLaunch Hybrid woods are like the Callaway Big Bertha 'Heaven Wood Hybrid' series of fairway metal woods. CaddyBytes will custom fit you to your door including Free Shipping (Continental U.S.A. Only.) Designed to give you a more playable set of golf clubs without the hassle of having to hit the long irons. These compact hybrid designed Black Shark MX EZLaunch Hybrid woods are available in 17 (Replacing the 2 Iron), 20 (Replacing the 3 Iron), 23 (Replacing the 4 Iron), and 26 (Replacing the 5 Iron) Degrees of Loft. Made of a tough and light 17-4 Stainless Steel with a 335 Tip to fit Techpower's Black Pro Spec Hybrid graphite shaft. These new hybrid fairway utility woods are easier to launch from the fairway and the rough than a standard hybrid design. Like the Callaway line of Heaven Wood hybrids, the new Black Shark EZLaunch is designed and engineered to maximize your potential and drive down your score but at a much more affordable price! Comes in a metallic black finish. Free Shipping Continental U.S. only. Price is $59.99 Free Shipping! Buy Two at once and get a discount (See Paypal Options Below) -with Techpower's Black Pro Spec Hybrid graphite shaft -(pictured below) Shipping is FREE UPS Ground 5 to 7 Days Continental U.S. only. Paypal payment options (options 2 and 3) are upgrade hybrid shaft choices below. $109.99 For TWO EZ Launch Hybrid Clubs with TP Pro Spec Graphite Shafts. Free Shipping! If you want More Than Two Hybrids Click Here and email us we'll ebill you a discounted price. $59.99 For One EZLaunch Hybrid with TP Pro Spec Graphite Shaft. Free Shipping! $89.99 For One EZLaunch Hybrid with Irod Shaft. Free Shipping! If you want two or more Hybrids Click Here and email us we'll ebill you a discounted price. $99.99 For One EZLaunch Hybrid with Graphalloy Shaft. Free Shipping! If you want two or more Hybrids Click Here and email us we'll ebill you a discounted price.